7.62mm Tokarev ammo with a full metal jacket is an extremely fast round. The fact the round is rather diminutive size-wise is made up for vastly by the fact the round travels at a blistering speed. 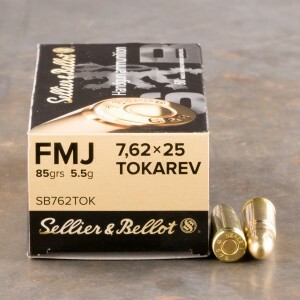 FMJ 7.62 Tok ammo was originally envisioned as a full metal jacket load (FMJ) to maximize both penetration and speed. The full metal jacket Tokarev round is an extremely capable at penetrating barriers and even light body armor. 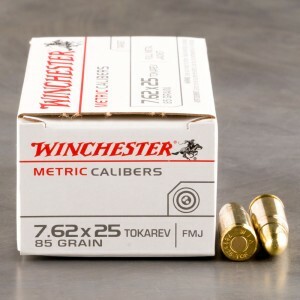 The 7.62x25mm Tokarev rounds are often the most available round due the surplus ammo on the market. The Tokarev full metal jacket load is capable of penetrating well above the 12 inches required by the FBI gel test. Ammo shot fine in my surplus Tokarev. S&B Is the best manufacturer in Europe, in my opinion. They always have quality products, and this ammo was no exception. Very hot, very clean and very accurate. I will definitely use this ammo again. S&B best ammo I've used. Clean and powerful. Perfect. Clean, no ejection hangs, AAA plus. Prompt delivery. Great product.